Establish and maintain a safe, clean, attractive, and effective physical environment. Promote teamwork and cooperation between all Operations department. Emphasize ongoing and clear communication with all departments within the district. Help build and maintain confidence and support for Mid-Del Public Schools within our community. The Mid-Del Public Schools Maintenance & Construction Department is located at 225 N. King Ave., Midwest City, OK. We provide skilled maintenance services to thirty-five (35) sites, twenty-eight (28) industrial kitchens, sixty (60) portable buildings, twelve (12) high school athletic fields, fifteen (15) middle school athletic fields, three (3) fieldhouses, and numerous auditoriums. 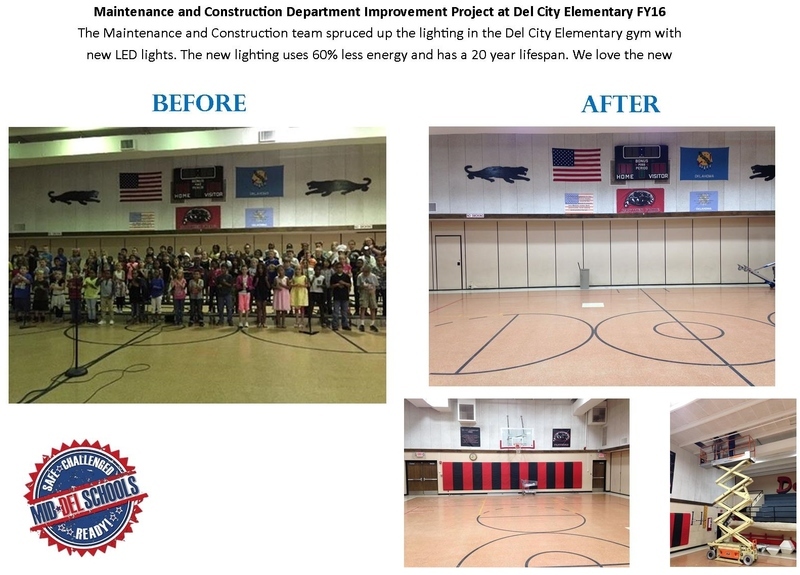 Our Mission is to provide efficient and effective maintenance and repair services for all Mid-Del Public School facilities.